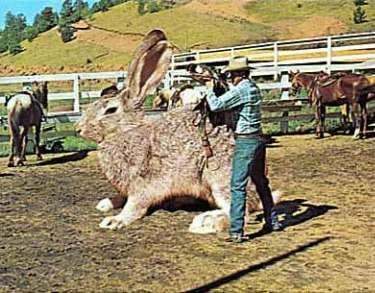 Texas Straw Hat – And Really Big Rabbits! You can subscribe to Southern Plate by email by clicking here, and receive an email from me each time I post something new :). When I was around seven or so , my grandmother Lucille, got to go to Dallas, Texas. This doesn’t seem like much these days but no one in my family had ever been out of our little corner of the country at that time it felt as if we had a world traveler suddenly among us! She went with a group of ladies from her work and even though it was only a short trip, she came back loaded down with postcards and souvenirs for all of us. I had no idea where Texas was at the time but my worn out Pecos Bill storybook record kept my mind reeling with what all Grandmama must have experienced – that and one particular postcard she sent me that I will never forget as long as I live. I just KNEW my Grandmama had ridden that rabbit! 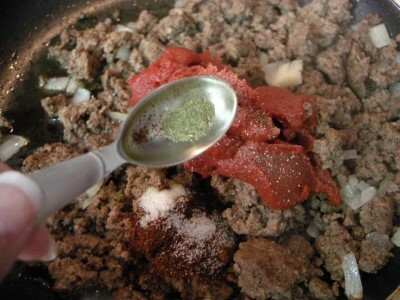 Today I’m bringing you another easy ground beef recipe. 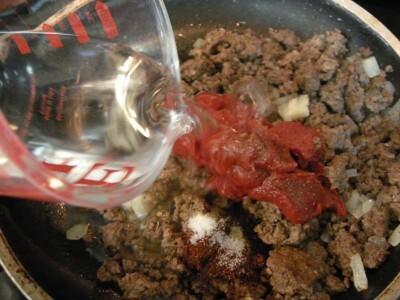 Don’t you just love recipes that use the words “easy” and “ground beef”? For me, that spells food for the masses! This one is also easy to tailor to what you have on hand so don’t go out buying special ingredients if you don’t already have them. 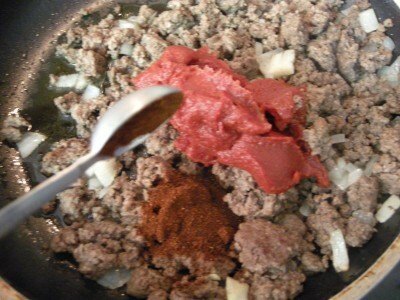 Feel free to add drained diced tomatoes or tomato sauce in lieu of the tomato paste, leave out the thyme if you like and just add a little extra chili powder. Cook it until it is nice and thick for layering and you’ve essentially just made yourself a Frito Chili Pie. But we’ll call it the same thing Granny Jordan did when she made it and maybe smile a bit as we think about how many tribes a Texas rabbit stew would feed! 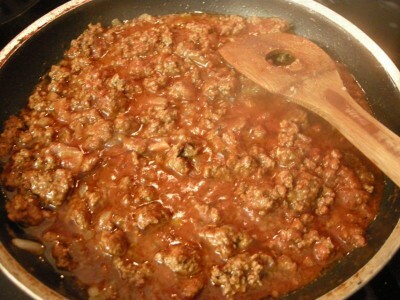 To make it by Granny Jordan’s recipe you’ll need: Chili powder, tomato sauce, onion, pepper, thyme, salt, fritos, and some cheese. And some ground beef, of course. 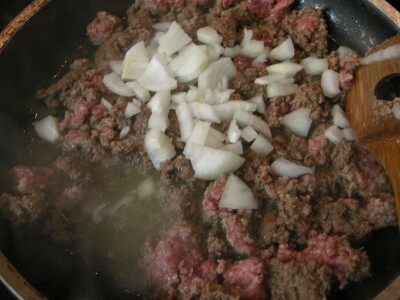 Brown your beef and onion together. You know what I’m gonna try next time that I think would be good? Italian seasoning. Y’all just don’t know how much I love that stuff! and pour in your water. Stir all of that up good and bring it to a boil. Reduce heat and simmer for twenty minutes, stirring occasionally. Serve atop corn chips, topped with cheese. Sour cream would be good, too! Brown beef and onion in a skillet. 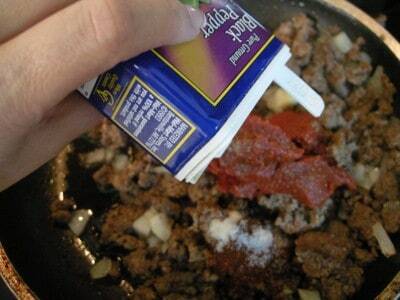 Drain off grease. Add all other ingredients except corn chips and cheese. Stir and bring to a boil. Reduce heat and simmer for twenty minutes, stirring occasionally. Serve atop corn chips, topped with cheese. – Mark Twain Submitted by Shawna. To submit your quote, please click here. Thank you so much for taking the time to read Southern Plate! If you enjoy SouthernPlate.com , please tell your friends. That looks sooooo good! I did a brief stint as a vegetarian last year, and boy am I glad I’m back to eating a little (or sometimes a lot!) of everything now! I’d probably drown mine in cheese and top with jalepenos… yum. This recipe is really just a fun starting point, isn’t it? YUM…..I love food like this! Thanks for always sharing great recipes with us!! Thank YOU for always reading and taking the time to comment and say hidy to me!!! Look forward to hearing from you every time! ooh, do you remember when Doritos first came out? Then later on we figure out that they were all giving us horrendous breath and stopped eating them so much in our dating years, lol!! Thank you so much! I love the Jackolope story! 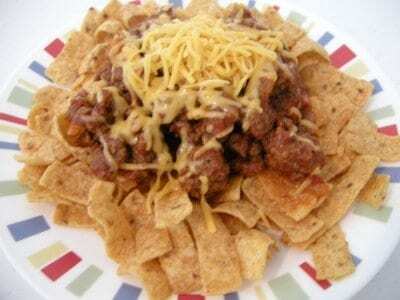 in texas this is frito pie!!!!!!!!!!!! Yes! That’s what I’ve called it all my life…Frito Pie. But everyone has their own name for it. I also like to add black olives and some raw onion (just a little bit). Yummy!!!! I just asked the family if they wanted chili for supper. We may have this instead. I’ll have to see if we have the Fritos. We bought a mixed bag of chips and I think the kids didn’t like those. They may still be around here. Okay, I LOVE THAT NAME for Worcestershire sauce!!!!!! We are now going to call it that from now on!!! and you cut and pasted? You smart girl, you!!!! Have a great weekend, Beverly! I make something like this that my kids love. Same premise but we use a can of Chili (actually for my family of 6 2 cans of Chili) and 4 oz. of Cream Cheese heat them both up til the cream cheese is all melted then finish up as you have. They love it! and if you have bags of the lunch size Frito’s you can carefully open the bag put the chili and cheese on top and you don’t have to dirty up a dish. Oh my, cream cheese? I think I just melted into cheesy bliss!!! I gotta try that soon! Hehe, my Mama is Janice, too. You don’t often run across more Janice’s! Omg my mama is Janice!!!! Thanks for another great recipe! I know what we will be having for supper tomorrow night! I am fortunate to have a hubby that loves groung beef, just about any way ya fix it. Meant to tell you also…….I made your wonderful Apple Dumpling recipe a few days ago,,,,only I used slightly under- ripe Nectarines! It was a HUGE success! Us real Texans throw in some refried beans over the chips then the meat sauce, then the cheese, sour cream, avocado/guacamole, and of course jalapenos. Then comes the PACE Piquante sauce…hot of course. We also use the jack-a-lope meat instead of beef…lol! Love this easy recipe & loved your story too. I had not seen that one but we did have postcards about the jackalope. It was great that your Granny left you with some wonderful memories. I didn’t know one of my grandmothers and the other died just before I turned 4 so my memories are very few. But, most of all I love your wonderful sense of humor. This is a good create your own recipe as I do the meat base in the skillet and have ingredients set out so each person can assemble to taste. I provide shredded lettuce, diced raw onion, chopped tomatoes, shredded lettuce, sour cream, refried beans, sloce dblack olives, jalapenoes and what ever else may be in the fridge or pantry. if I am lacking something it is an “oh well” till next time. After the assembly choice evertthing then is smothered in shredded cheese. My other little rule is that I always use paper plates for these so we can throw away the melty cheese mess. We call these “Pepper Bellies” 🙂 NUMMY. this looks delish… never had it quiet like this. Thanks Christy! Loved the story too! My awesome Grandparents lived in Dallas for the first 10 years of my life….every summer, our 2 week trips out “west” to see them and back to Atlanta in the back of our station wagon always held excitement and wonder for me. I LOVE Texas, plus all the silly souvenirs at every gift shop. Thank you, Christy, for bringing up dear memories of precious times gone by. Worrchsestireer sauce is a tough-y to say and spell ;-} so I usually mumble it, and quickly, despite my English heritage. ~sigh~ We do use mmubmblemummblele quite often in making dishes. Fritos are my FAVORITE chip or snack….so much so that I won’t buy them, or they would be gone in a flash. The saying goes, “Once on the lips, forever on the hips” so I know my limits. So maybe, next time I make chili, I will spring for a smaaaaall bag, so not many will be left….tee hee. Honey-pie often hosts a Poker Game night here and this would be a thumbs up from all the men, for sure. Thank you again for all the time and effort you are always putting out to others so selflessly. I personally think that you ROCK! Thanks Christy, I live right outside of Houston, Texas and never even thought of using homemade chili for this. In concessions stands at our little field we cut open a bag of fritos along the long edge, pour a little chili right on top and then top with cheese. It’s a built in bowl! The kids love it! I will definitely try it with homemade chili next time we have it at home! You didn’t know we have those big bunnies as pets in our backyard here in TX!! LOL Just kidding!! Looks yummy! Reminds me of going to the consession stand at baseball games and eating frito pie! Yum!! What a great, easy-to-put-together, have-on-hand-ready snack or dinner! p.s. I haven’t been on a swing in ages! What fun!! Thanks for another great recipe…and speaking of Worcestershire sauce…I just call it Rooster sauce! This brings back memories. 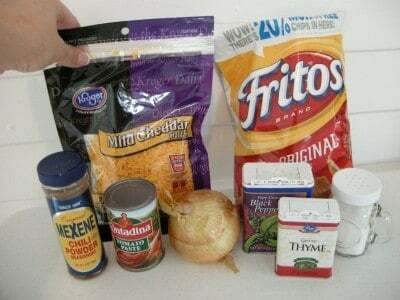 Yes, I am from Texas and this recipe is a version of our “Frito Pie”. When our youngest daughter was told by the orthodontist that her new braces would keep her from eating Frito Pie she cried !! She wasn’t in the least bit concerned with having teeth pulled or the wires tightened. I couldn’t stand to see her so heartbroken so I would make the chili portion more like regular chili and pour it over the chips and let them soften up. We toss on raw,diced onions and some cheese on top..sometimes some sour cream and hot salsa. Yummy ! I love this, it is the same as my taco salad, but I put nachos underneath, but I think your way is better. I love corn chips! 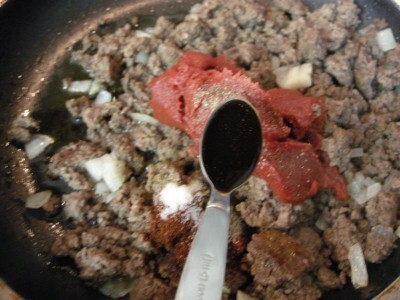 I season my beef and tomato paste with cumin, coriander, oregano, chili powder, garlic and onions. I wanna try it your way too, the thyme sounds lovely! Great recipe, but I’ll have to through a bunch of lettuce and tomato on top to fool myself into believing its healthy for me. LOL! Christy! Before I read the recipe I thought you were talking about making a real hat. LOL!!! I’ve never heard of Texas Straw Hat because we just call something like this nachos. One of the ladies I work with is always bringing nachos for lunch. She’ll make her bean mixture (because she is vegetarian! ), her cheese, salsa and chips and assemble it for lunch. Hey, Christy! The postcard is a hoot!!! My daughter keeps asking “Is it real?” Thanks for the laughs. By the way, our supper tonight was ‘fast food’ fabulous~~pork chop biscuits, corn on the cob and fried peaches. The fried peaches were sort of a combination of several of your recipes. With your help, meals around here are looking a lot better! Thanks! Have a great day! Hi MaryC. How did you cook the peaches? Fresh/Frozen/or Canned?Sounds good. Hey, Mary! I used a large 29 oz. can of sliced peaches in light syrup and dumped them into a heavy bottom skillet. I didn’t measure anything, just added a couple of tablespoons of margarine, about that much brown sugar, some cinnamon and allspice with a dash of salt. I got them good and hot with the lid on, them cooked on medium without the lid while everything else was being prepared. A little stirring now and then, and after probably 30 minutes or so, they had cooked down a little and made THE BEST topping for the buttered biscuits. Great to hear from you~~have a great day! 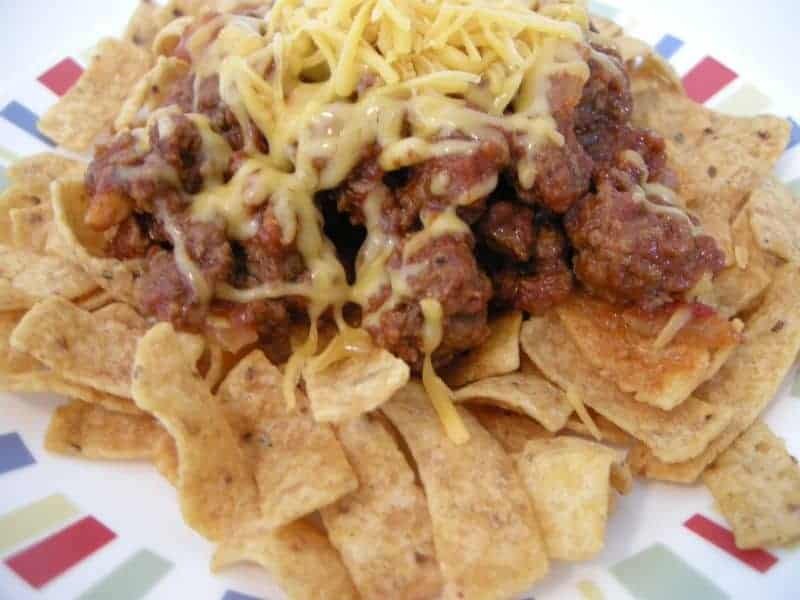 Our school and local pool serve chili and the cheese inside the bag of fritos all mixed together and call it a “walking taco”, the kids just love them. I love the recipe and the quote! 🙂 I’m looking forward to seeing you on Ellen and the food network, these are my goals for this month. 😀 Beautiful first segment, by the way. Hi Christy. I’ve never heard the name Straw Hat, but variations of this abound in Texas. Kids, teens, and tailgaters love a single serve frito bag split down one side with beef toppings and cheese and dieters top a tossed green salad with beef and cheese (no chips or a few on the side, and the combination of cold, crunchy salad and hot beef is great). A famous local barber shop has trophies on all the walls, native animals and a few from foreign parts, like a full size bear standing on its hind legs. Among the deer and antelope heads is a “jackalope” (jack rabbit with antlers) that is very realistic. Everyone looks and everyone smiles. Did you ever wonder why old fashioned barber shops turn their customers so their backs are to the mirror before they start cutting? Beauty shops would never get by with that!